Fiat Panda Mamy targets mums | What Car? Fiat is targeting young mums with the launch of its special-edition Panda Mamy supermini. Based on the 1.2-litre Panda Dynamic, the Mamy has mum-oriented features such as a second rear-view mirror for watching children in the back seats, bag hooks in the boot, front seat covers with pockets at the back, washable front and rear seat upholstery and a high-grip mat in the boot. Other standard equipment includes air-conditioning, Bluetooth hands-free phone compatibility, a 50/50 split and sliding rear seat with ISOFIX child seat attachments, a height-adjustable driver's seat, a CD and MP3 player, anti-lock brakes, two front airbags and remote central locking. 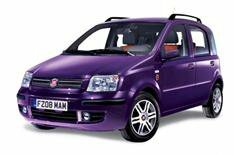 The Mamy is available in aubergine, orange, black and grey paintwork. Costing 8200, the Mamy is 5 less than the Panda Dynamic Aircon model, despite having 1000 of extra equipment.